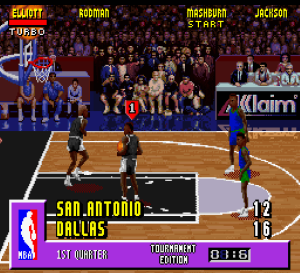 NBA Jam Tournament Edition is one of those games I’d definitely enjoy much more if I had any interest whatsoever in pretending to play basketball. I know it’s stupid and missing the point, but I prefer to do things in video games that I can’t do in real life. Granted, I can’t play basketball worth a damn (I assume), but if I wanted to, I could likely learn. Maybe I’ll go down to the local YMCA and try and hire a basketball coach (I won’t)! In order to write this review I selected the “Head to Head” setting; it pits two men I’ve never heard of against two other men I’ve never heard of. Ok, that’s not entirely true: I do know who Dennis Rodman is due to his flamboyant antics and the fact that I dislike everyone associated with PETA. I’m totally cool with vegetarians and vegans so long as they don’t try to talk me out of tearing the neck out of a baby lamb, which is my traditional English breakfast. And they always do! Every. Single. Time. “It’s in pain! Can’t you hear it screaming?” “It’s bleating and it won’t be able to much longer anyway. Pass the butter.” Mmm. Baby lamb neck in butter. This game looks and sounds decent enough; there are fairly clear pictures of each player, and the little announcer voice isn’t bad for a SNES game. Sadly, I like terrible video game voices. They make me laugh, which is like a little gift from the people who make the games. The gift of laughter. That I waste. On everything. The gameplay was quick and furious, with an awful lot of running back and forth. It made me tired just watching! I had to stand up so I could sit down again. Even though I’d never played before and had no idea what I was doing, the controls were intuitive enough that I managed to tie my opponents. I did find myself grinning every time I slapped the ball away from my opponents, even though it made an odd barking sound effect every time I did so. Perhaps my spirit animal (a snickerdoodle) was giving me aid? I bet this game is awesome to play with a bunch of drunk friends who hopefully aren’t racist. Stop being racist, you drunks!